These are the type of centrifuges currently most widely used in sludge treatment applications. Their main advantage is a noticeably improvement of the cake dry solids contents that now position these units between belt filters and filter presses. Increased centrifugal force: 3 000 g acceleration (or even 3 500 g) is currently being used (strengthened bearings). Increased bowl internal capacity: a considerable amount of cake can now be stored in the machine, resulting in far longer centrifugation times (5-10 minutes). Very high torque operation: the drive torque reveals screw friction stress and, therefore, depends on the extent to which the machine is filled and also on sludge shearing stresses. Therefore, a high torque figure means that the maximum amount of sediment is being stored, especially in the shear zone (figure 35 compared with figure 30, the latter representing a traditional – low pressure – machine). High torque operation requires strongly built reduction gears and a screw differential speed control (VR) based on the torque value in order to prevent the machine from becoming blocked and to produce stable dry solids contents. High pool depth and, therefore, high radial hydraulic pressure. The ring level must be adjusted according to sludge quality. However, the liquid ring’s internal diameter is very often smaller than that of the machine’s cone outlet (figure 30 shows an HP centrifuge at start-up where the centrate overflows with the sediment). On the other hand, under stable operating conditions (2-3 minutes after filling start with sludge), the sediment plug in the cone will prevent the liquid from being discharged through the cake outlet (figure 35). shearing the sediment to further encourage water release. Higher amounts of polymer: dry solids contents can only be increased by overdosing polymer, approximately 70 to 100% more than the amount used with belt filters, filter presses or the old low pressure centrifuges. Bowl speed VA: it is reasonable to operate at 85-90% of the machine’s maximum speed. Differential velocity VR: in fact, this VR will depend on the torque set point. The aim is to maintain a constant torque value by adjusting the conveyor speed. If the torque tends to increase, the VR will accelerate to empty the machine a little and vice-versa. Normal VR figures range from 1 to 5 rpm. Pool depth: adjustable by altering weir settings at centrate discharge louvers.Some constructors offer liquid level adjustment systems inside the machine when the latter is running. Sludge flow rate: a certain improvement in dry solids content can be obtained by reducing the machine’s nominal output. Choice of polymer: with many sludges, higher dry solids content (1 or 2 points) can be obtained by using reticulated polymer emulsion. 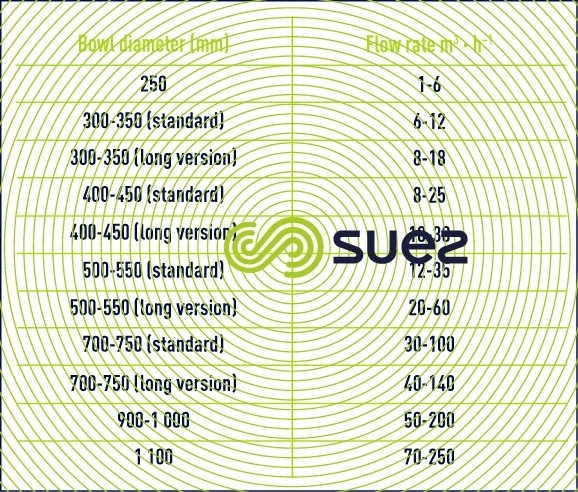 Polymer flow rate: this flow rate can be well adjusted by controling the mass flow rate at the centrifuge intake (providing an effective sludge concentration measurement snesor is used). The polymer flow rate can also be set on the centrate’s turbidity; however, the reliability of this type of process remains something of a problem (presence of foam, of flocculated suspended solids...). Sludge temperature: 1 to 3 extra dry solids content points can be obtained by heating sludge around 60°C and 65 °C. However, it should be noted that, at these temperatures, centrates will be more heavily loaded with dissolved carbonaceous pollution. Flocculation tests (with high shear levels) are used to select polymers that create a stronger floc. Centrifugability tests (see the dry solids contend approach of an industrial centrifuge) can be used to evaluate sediment volumes and dry solids contents and; are able to fix the permissible mass flow rates with a rather good estimate. The best way of assessing a centrifuge’s satisfactory operation is still calculating the extraction yield called the recovery rate Tc (as a %). CA = sludge concentration at machine intake, allowing for the added polymer and its dilution (as % suspended solids). The recovery rate must be better than 95% for most sludge (or even 97-98% when the sludge is concentrated: > 50 g · L–1) or centrates ranging from 0.5 to 1.5 g suspended solids · L–1. QS = sediment mass flow rate. However, this supposes that sludge flow rate is measured at the machine intake and that the cake is weighed as it leaves the machine; therefore, this is not an easy measurement. Clearly, the hydraulic flow rate depends on the concentration and nature of the sludge and at the centrifuge intake, which explains the wide ranges given in the table. Thickening and dewatering can be carried out in one single stage and diluted sludge dewatered accordingly. 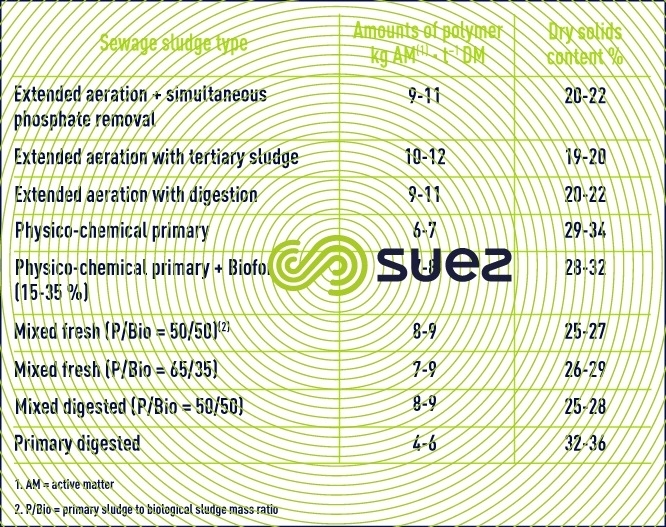 The main application concerns extended aeration sludge but 10‑15 g · L–1 sludge can also be dewatered: e.g. sludge exiting the static lamellar settling tank or sludge blendings (thickened primary sludge and non-thickened biological sludge). The main benefit is the saving in thickening investment (partly offset by the larger size of the centrifuges) and the possible saving in polymers needed by some dynamic thickening units. On the other hand, this system requires an essential precaution: a relatively stable concentration must be maintained (± 1 g · L–1) at the centrifuge intake which assumes, in many cases, a sizeable homogenisation tank upstream from the dewatering unit. 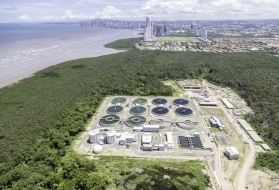 In effect, when biological sludge is extracted direct from a secondary settling tank recycling pit, these concentrations can fluctuate from 6 to 15 g · L–1 depending on the plant’s hydraulic operating conditions, resulting in dewatering malfunctions. In the larger wastewater treatment plants, extraction concentrations are more stable and the settling of this mixing tank can be avoided; it can be replaced with a mass flow rate control on the centrifuge intake. The dry solids contents obtained will be similar to those produced by classic dewatering on pre-thickened sludge (e.g. approximately 20 % with extended aeration sludge); on the other hand, we need to work with a centrate of exceptional quality (centrate containing 0.2-0.3 g suspended solids · L–1) if we want to maintain a good recovery rate despite the low concentration at the machine’s intake. Therefore, the amounts of polymer (emulsions are highly recommended) will be slightly higher (11-12 kg AM · t–1 DS for prolonged aeration sludge). In direct centrifugation applications, centrifuge dimensioning is carried out on a maximum hydraulic flow rate because the mass flow rate is no longer the limiting factor in this case (e.g. 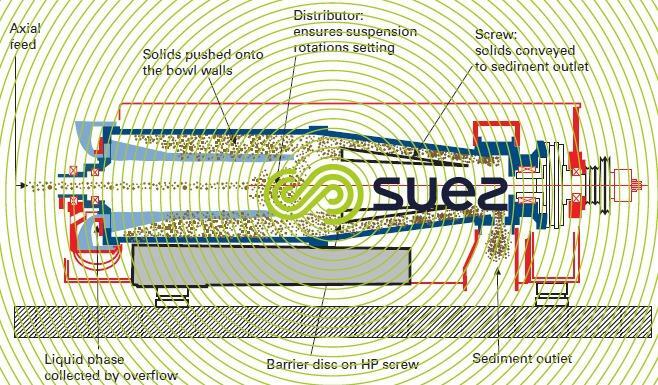 on 7-9 g suspended solids · L–1 prolonged aeration sludge, a 500-550 bowl diameter centrifuge, long version, will cope with flow rates in the region of 55-65 m3·h–1. Energy consumption per tonne of dewatered sludge will still be higher because these machines do not work at the maximum mass flow capacity: depending on concentrations at the machine’s intake, we will see consumptions of 120 to 200 kWh · t–1 suspended solids compared with 60 to 80 with the same pre-thickened sludge.